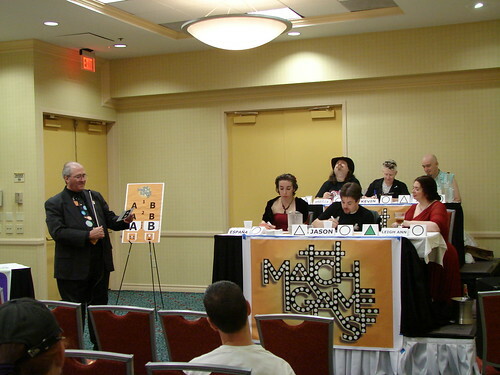 Saturday afternoon's Match Game SF had a decent turnout, and I think it was one of our better shows. The room setup could hardly have been better, although we did have to rearrange the speakers when the panel in the adjacent room complained about the noise. They complained further from the sound of the laughter from our room; however, I won't apologize for that. We do not have any pictures from Saturday afternoon's show; however, Lisa did take pictures at the previous night's show. For the first time ever, we had two levels of riser, so that both the front and rear ranks of panelists were visible from more than a few rows back. This worked very well. The contestants were in the correct relative position, and I had lots of room to move around. Lisa did a great job setting up the wireless belt pack so that I could use the ECM-51A "Gene Rayburn" microphone without having to dodge a long cable. 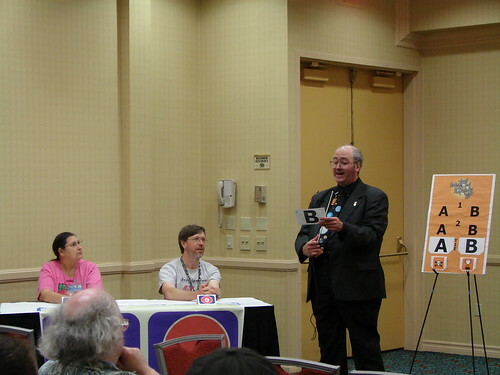 The panelists did their usual excellent job of combining wit and whimsy with the occasional contestant match, allowing us to give away some prizes. 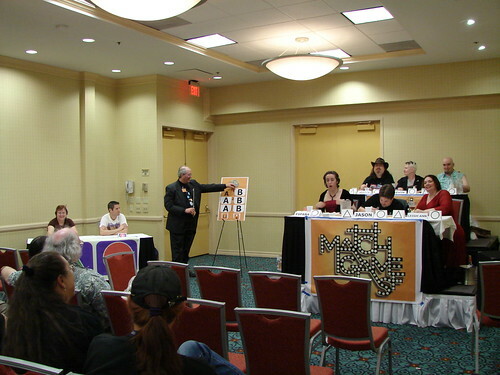 We had two first-time panelists on Friday night, shown here: Warren Buff (seat 1) and España Sheriff (seat 4). Our announcer on Friday night was Allison Lonsdale, and she swapped places with Warren, who announced Saturday's show. After what I think was a pretty happy audience filed out after the show, Lisa, I, and our volunteers tidied up the set, put away the cards, struck the cables, boards, etc. that make the magic happen, and I got one of the wonderful hand-carts that LASFS owns and makes available in the Con Office (helpfully located right across from our show). Lisa was moving very slowly because she's developed horrible back pain this weekend, sometimes leaving her in excruciating pain. (I wish someone was doing massages here like they sometimes do at BayCon; we would have paid for a full-course of treatment if it would reduce the pain.) Fortunately, we had three hours before the next panel in the room, so we could take our time. We moved to my van a couple of cart-loads of the heaviest and bulkiest things like the speakers, the sound board, and the Match Game Boxes with the remaining prizes, questions, and the cables and other tech that make the show work. Then I changed out of my suit and we walked down to Souplantation, where I had what may be the first stress-free meal I've had in four days because there were no more deadlines looming over me. Upon returning to the hotel, we borrowed the Magic Folding Hand Truck again and moved more stuff out of the hotel room, leaving us mostly we just our personal luggage and few odds and ends. I also asked for and got a 3 PM check-out Sunday, which further reduces the stress. Thank you once again to everyone who participated: panelists, announcers, contestants, audience, and as always the crew, starting with Lisa, who had to "play through pain" and run the sound board while her back tried to wrench her into Van Nuys. It's a cooperative effort for us to put on a show for each other, and I still have a good time performing the show; I hope everyone else participating in it is still having fun, too.